Who is Hargobind Khorana and why is he on Today's Google Doodle? Who is Hargobind Khorana & Why is he on Today’s Google Doodle? 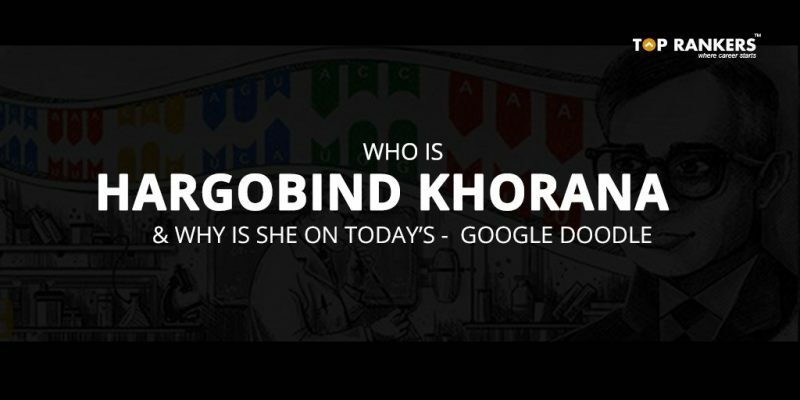 Things to know – Who is Hargobind Khorana & Why is he on Today’s Google Doodle? Who is Hargobind Khorana & Why is he on Today’s Google Doodle? well, 1968 Nobel Prize laureate for Physiology or Medicine with Marshall W. Nirenberg and Robert W. Holley for research that showed how the order of nucleotides in nucleic acids, which carry the genetic code of the cell, control the cell’s synthesis of proteins. Khorana and Nirenberg were also awarded the Louisa Gross Horwitz Prize from Columbia University in the same year. An Indian – American Bio-chemist was born on 9th January 1922 in city of Raipur in the British India. The youngest of five children of Ganpat Rai Khorana, a taxation clerk and Krishna Devi Khorana. He served as a faculty of the University of British Columbia from 1952-1960, where he initiated his Nobel Prize winning work. He became a naturalized citizen of the United States in 1966 and subsequently received the National Medal of Science. He co-directed the Institute for Enzyme Research, became a professor of biochemistry in 1962 and was named Conrad A. Elvehjem Professor of Life Sciences at University of Wisconsin–Madison. He served as MIT’s Alfred P. Sloan Professor of Biology and Chemistry, Emeritus and was a member of the Board of Scientific Governors at The Scripps Research Institute. Ribonucleic acid (RNA) with three repeating units (UCUCUCU → UCU CUC UCU) produced two alternating amino acids. This, combined with the Nirenberg and Leder experiment, showed that UCU codes for Serine and CUC codes for Leucine. RNAs with three repeating units (UACUACUA → UAC UAC UAC, or ACU ACU ACU, or CUA CUA CUA) produced three different strings of amino acids. RNAs with four repeating units including UAG, UAA, or UGA, produced only dipeptides and tripeptides thus revealing that UAG, UAA and UGA are stop codons. With this, Khorana and his team had established that the mother of all codes, the biological language common to all living organisms, is spelled out in three-letter words: each set of three nucleotides codes for a specific amino acid. Their Nobel lecture was delivered on 12 December 1968.Khorana became the first scientist to chemically synthesize oligonucleotides. He later extended the above to long DNA polymers using non-aqueous chemistry and assembled these into the first synthetic gene, using polymerase and ligase enzymes that link pieces of DNA together, as well as methods that anticipated the invention of PCR. These custom-designed pieces of artificial genes are widely used in biology labs for sequencing, cloning and engineering new plants and animals, and are integral to the expanding use of DNA analysis to understand gene-based human disease as well as human evolution. Khorana’s inventions have become automated and commercialized so that anyone now can order a synthetic oligonucleotide or a gene from any of a number of companies. One merely needs to send the genetic sequence to one of the companies to receive an oligonucleotide with the desired sequence. Since the middle of the 1970s, his lab has studied the biochemistry of bacteriorhodopsin, a membrane protein that converts light energy into chemical energy by creating a proton gradient.Later, his lab went on to study the structurally related visual pigment known as rhodopsin. In 1978 he was elected as the foreign member of royal society (ForMemRS). The University of Wisconsin-Madison, the Government of India (DBT Department of Biotechnology), and the Indo-US Science and Technology Forum jointly created the Khorana Program in 2007. The mission of the Khorana Program is to build a seamless community of scientists, industrialists, and social entrepreneurs in the United States and India. The program is focused on three objectives: Providing graduate and undergraduate students with a transformative research experience, engaging partners in rural development and food, security, and facilitating public-private partnerships between the U.S. and India. He was a widower since 2001 and was taken care by his children, Julia and Davel. On 9th November 2011, the great Indian Bio-chemist closed his eyes forever due to natural causes. Its true that the legend is no more but the legacy he left behind will always be remebered by the mankind. Today we at Toprankers salute him for his immense contribution to the world of Science. Stay tuned for more related articles like this. If you have any query or suggestion, Do write us in the comments below. Posted in General Awareness, GkTagged Who is Hargobind Khorana & Why is he on Today’s Google Doodle?